Too much tourism can affect a country in some negative ways. Travel can cause pollution, travel can push people off their desirable land in favor of large, foreign-owned resorts, and travel can bring unwanted change to a country’s culture. Islands in the Caribbean Sea along big cruise ship routes can attest to this phenomenon. While tourism brings employment and money, it’s not all necessarily good news. One of Global Basecamps’ main goals is to change this. We don’t shy away from our mission of making travel more sustainable, and in few countries demonstrate the value of sustainable travel more than Peru. Historically, Peru’s economy has been driven by its natural mineral mining industry. In the later half of the 20th century, its economy was once again transformed, as Americans and Europeans heard of its cultural treasures, and tourism boomed the best Peru tours quickly became a bucket list item. Along the way, Peru has learned some hard lessons. Traffic along the Inca Trail to Machu Picchu grew at an unsustainable rate, and the Inca sites along the Trail suffered for it. Peru quickly realized that preservation of its historic sites was as important as the tourism they attracted in the first place. Similarly, the local workers who drive the tourism industry are just as important. In a changing world, where growing potatoes and quinoa can no longer sustain a family, tourism is becoming one of the best paths to a professional career. Another of Global Basecamps’ main goals in Peru is to make sure that all our local guides, drivers and porters are paid a living wage. Let’s move our analysis up the economic chain. 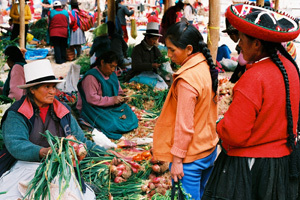 More and more, Peruvian hotels are owned by local Peruvians. This is great news for Global Basecamps, as our goal is to book exclusively with locally owned hotels whenever possible. Ultimately, this means that our travelers’ tourism dollars are flowing back to Peru, rather than some foreign investor. This leads to more local economic growth, and eventually, the effect snowballs in Peru’s favor. One of our favorite analyses of the effects of tourism on local Peruvians is the documentary film, Mi Chacra. (Read our long review here.) This film follows the life of a country-born Peruvian named Feliciano, whose family has farmed the land they live on for generations. Modernization has caused more and more farmers to move to the city, and Feliciano is left to porting luggage on the Inca Trail in order to save for his newborn son’s future schooling. As much as Global Basecamps is dedicated to its travelers, and ensuring that their trip is picture perfect, we must also strive to make lives like Feliciano’s just a little easier as well. Like many countries around the world, tourism in Peru is helping preserve its natural treasures as well as its cultural ones. Conservation of flora and fauna in the Amazon is directly funded through tourism. Awareness is also being brought to the problems facing the Andean mountain range. This year, Global Basecamps is funding the planting of 10,000 native trees in the Peruvian Andes. These trees will serve two purposes: the continued fight against global warming, and the encroachment of foreign trees brought in by settlers to the region. Ultimately, there is no doubt. Tourism, managed on a large scale in a responsible and sustainable way, will help Peru and its people indefinitely. Would you like to learn more about Peru tours? 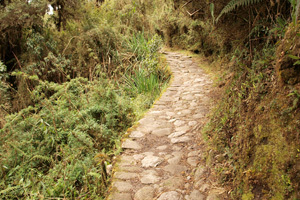 Are you interested in planning your hike on the Inca Trail? Download our completely free travel guide by clicking below.